Tony Stark goes through Iron Man suits like they’re going out of fashion. 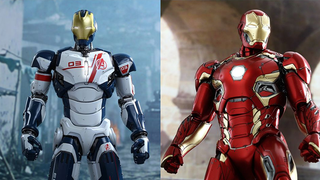 It seems like Hot Toys have a very similar approach, because they’ve announced another two Iron Man related figures that they would really like you to add to your Iron Legion. Yes, you didn’t think that the Age of Ultron 1:6 figure line could escape yet another Iron Man suit, did you? Hot Toys have unveiled both the Mk 45 that makes is debut in the grand battle scene in the last half of the film, and an Iron Legion drone as the latest additions to the team. I mean, okay so the drone isn’t technically an Iron Man, but it might as well be. The Drone is the plainer of the two figures, with not much in terms of accessories outside a small wrist-mounted rocket launcher to place on either wrist, and some LEDs in the head, chest and palms. It’s a decidedly spartan, but I guess that’s the point: If you have, like a hojillion dollars to spend on pretty toys, you could buy a bunch of Iron Legion drones and have a defence network of your own to protect your toy shelf. I mean, personally I think you’d be crazy to do so, but also awesome. I’d be a bit jealous of your vast quantity of money and your sizeable army of Iron Men. The real star however is the absolutely fabulous Mk 45 Iron Man, who is as sleek and as shiny as his movie counterpart. Like the Drone Iron Man has lights in the chest, head and palms, but he comes with a lot more in terms of accessories: effects pieces to create repulsor blasts and jet thrusts, some lovely little wrist laser pieces that almost make it look like Iron Man’s firing copies of Mace Windu’s lightsaber out at people (Marvel, Disney, Lucas, think of the crossovers! ), and to top it all off, the disembodied torso of an Ultron drone, to carry around like a hefty metallic trophy piece. The Iron Legion Drone and Mk. 45 Iron Man will be available in Early 2016. Prices have yet to be announced, but expect the Drone to be a wee bit cheaper than the usual $230 price tag, and for the Mk 45 to hit around that cost too.